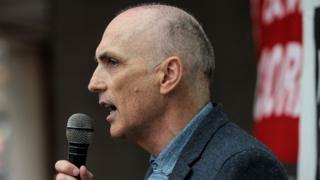 Labour MPs have criticised their colleague Chris Williamson for saying the party has been “too apologetic” over anti-Semitism. In footage published by the Yorkshire Post, Mr Williamson, who is a close ally of Jeremy Corbyn, told activists Labour was being “demonised as a racist, bigoted party”. Deputy leader Tom Watson said he had been “deliberately inflammatory”. The BBC has approached Mr Williamson and the Labour Party for comment. Labour has struggled to contain a long-running row over claims of anti-Semitism – hostility or prejudice directed against Jewish people – within its ranks. Nine MPs quit the party last week, criticising the leadership’s handling of the issue. At an event in Sheffield last week – organised by grassroots Corbyn-supporting campaign group Momentum – MP for Derby North Mr Williamson said: “The party that has done more to stand up to racism is now being demonised as a racist, bigoted party. Momentum has not responded to the BBC’s request for comment. A Labour spokesman said: “It’s completely inappropriate to book a room for an event about an individual who is suspended from the party and subject to ongoing disciplinary procedures. Stephen Doughty, Labour MP for Cardiff South and Penarth, said Mr Williamson’s comments in the video were “unacceptable” and had “no place in our party”. And his colleague Stella Creasy, MP for Walthamstow, also expressed her unhappiness. Earlier this month, the Labour Party’s general secretary, Jennie Formby, said the party had received 673 complaints in 10 months alleging acts of anti-Semitism by its members.